I was just in a car accident. What should I do before hiring a personal injury attorney? 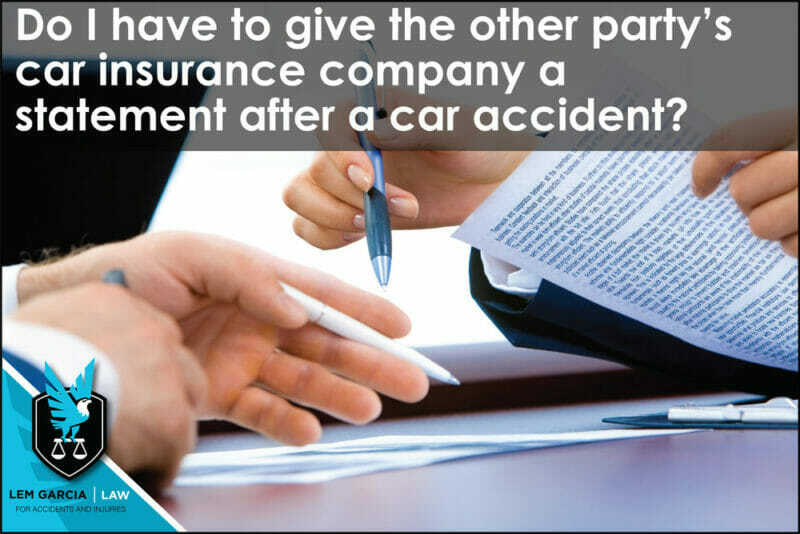 After you’ve been involved in a car accident, the other party’s insurance carrier will want to take your recorded statement. The other party’s insurance adjuster might even tell you that it is required that you provide it to them in order for them to pay you for your property damage claim and/or your bodily injury claim. If you find yourself in this situation, do not provide them with the recorded statement. You are under no obligation to provide the other party’s insurance company with a recorded statement about what happened or any other details about your car accident. The reason why the other party wants to take your recorded statement is because they want to either reduce the value of your claim or reject all together. The other party’s insurance company is not trying to make sure you get compensated for all of your damages. No matter how nice the insurance adjuster might sound on the phone, ultimately their job is to pay you as little as possible for your case. The insurance company hires insurance adjusters to save them money, not to make sure people who have been injured in accidents get paid fairly. The other party that wants to make sure that you get paid fairly for your injury claim is your attorney. If you do not have an attorney, you should make sure to get one. At the very least, consult with an experienced attorney to make sure that you do not get taken advantage of or damage your case inadvertently. When the insurance adjuster takes your statement, they will ask you questions to elicit answers from you that might make it sound like the crash was your fault. They will also ask you questions to make it sound like that you were not injured in the crash or that any injuries you might have suffered happened from anything else but the car accident that just happened. If you’ve been involved in a car accident, West Covina car accident lawyer, Lem Garcia, is ready to answer any and all of your questions and provide as much as help possible to you so that you don’t get taken advantage of by the insurance company. Case consultations are always free and without any obligation.